Well,well; it’s amazing what one finds out by reading the Guardian. Had I not read the October 28th editorial “In praise (I think that’s British understatement) of George Soros” for instance, I would never have discovered that I’m apparently of a curmudgeonly persuasion. It turns out too that I’m deemed to remain “an ill-tempered person full of resentment and stubborn notions” (according to the dictionary) for the Guardian informs me that “[o]nly the most curmudgeonly of his critics could fail to admire what the billionaire is doing with his money”. As a socialist, I do resent the fact that the Soros fortune was mostly made by carelessly playing around with the lives of the little people affected by currency speculation. Short sellers and operators of hedge funds for the super-rich are not the traditional type of praiseworthy hero for a Left of centre newspaper, but the Guardian’s apparent ‘conversion’ indicates just how far it is prepared to go in sanctifying the methods in order to realise the aim. I’m afraid that I must also plead guilty to holding on to the stubborn notion that the legalisation of drugs – one of Soros’ pet campaigns – is not a positive step for society to take, particularly in light of the well-known link between drugs and the financing of terror, but also due to my experience as a health-care professional who has often had to deal with the devastating effects of drug use not only upon the lives of addicts themselves, but also upon their families and even innocent bystanders. But the aspect of Soros’ ‘chequebook advocacy’ which makes me most ill-tempered is his support for organisations which aim to eliminate the Jewish nature of Israel and undermine the elected government of a democratic nation by means of delegitimisation. Call me old fashioned, but I prefer to live in a society in which we count votes, not cash; in which every voice carries equal weight, regardless of wealth or connections. The sad thing is that once upon a time, the Guardian believed in that too. Soros’ ‘Open Society Institute’ funds a whole host of operations in Israel such as Adalah, Peace Now, Breaking the Silence, Gisha and Yesh Din. Adalah works towards a one-state ‘solution’ in which the Jewish nature of Israel would be replaced by a “democratic, bilingual and multicultural” framework. Jewish immigration would only be permitted for “humanitarian reasons.” In other words, millions of Palestinian refugees would be brought to Israel, but Jews would be severely limited in their right to immigrate as the Law of Return would have been abolished. Adalah promotes the erroneous and delegitimising concept of ‘Israeli apartheid’ and contributed significantly to the infamous Goldstone Report. Soros’ Open Society Institute has provided legal assistance to Adalah in its attempts to overturn the Israeli law which states that spouses from enemy states are not automatically granted Israeli citizenship for reasons of security. That’s not only foreign intervention in the internal legal affairs of a sovereign state, but also reckless gambling with the lives of Israeli citizens. Soros recently donated $100,000,000 in matched funding over a period of 10 years to Human Rights Watch. Readers will no doubt remember that just over a year ago Human Rights Watch’s founder, Robert Bernstein, accused the organization of “helping those who wish to turn Israel into a pariah state”. The generous Soros pledge does not bode well for any kind of improvement in the organizational culture at HRW ; in fact one might even say that this is a case of ‘birds of a feather’ joining forces – supposed political agenda-free ‘human rights’ activists using the language of civil rights and democracy in order to promote extremist ideology. And if that sounds a little far-fetched, consider the following. The vice-chair of Human Rights Watch’s Children’s Rights department is Bernardine Dohrn – a Clinical Associate Professor at Northwestern University’s Department of Law and formerly a member of the advisory board of the American Civil Liberties Union, which has also enjoyed Soros funding. Of course North American readers may better remember her as a member of the radical Weather Underground Organisation which was active in domestic terrorism in the USA in the 1970s. Yet another former Weather Underground member, Linda Evans, was the recipient of a ‘Soros Justice Fellowship’. Here then we have a member of the Soros funded Human Rights Watch who is prepared to go beyond the compilation of excessive numbers of biased reports in order to delegitimise Israel and actually lend physical co-operation to the attempts by Hamas to gain international support for the breaking of the blockade aimed at preventing terrorists from getting their hands on weapons with which to kill, maim and intimidate the Israeli civilian population. Dohrn’s penchant for violent radicals is by no means confined to Hamas; anybody who is against Israel as a Jewish state will apparently be deserving of her support, as indicated by the fact that she travelled to Tel Aviv in March 2010 in order to meet representatives of the ‘Smash EDO’ group from Brighton in the UK and far Left activists from Israel. According to their own reports, they discussed “strategies” and a “plan for the future”. One has to ask just how these actions of a member of an organization funded by Soros can possibly align with his purported visions of “vibrant and tolerant democracy”, and of course they don’t unless one is either terminally naïve or incurably stupid. The Guardian is neither, but it is part of that section of world opinion which is so drugged up on anti-Israel propaganda (including its own) that it no longer distinguishes between an existing democracy and ideologically inspired attempts to destroy it. That is why it has no problem wasting column space on praising a man who circumvents and undermines democracy by use of hard cash, just as long as he fits in with the “progressive” anti-Israel agenda. If objecting to such forms of pseudo-philanthropy makes me ‘curmudgeonly’, then so be it. In the case of Soros, it’s a label I’ll wear with pride. Well said, IN. That puff-piece for this reprobate was possibly a new low for the Guardian. Can you imagine the salaries these parasites are giving themselves? Contrary to most of us posting here, Soros is a real Jewish man. Unlike others, he has got all the credentials to prove it. Talk is cheap and bickering on the sidelines (as many of us do here) even cheaper. How many of you have ever spared a dime for a good cause? Let alone billions? Soros witnessed as a teenager in the 1940’s the history in its most tragic, cruel and dehumanized form. Even if it were for this simple reason alone, he’d deserve the respect of us all, of Jewish background or not. To call Soros a brave person would be an understatement. He’s someone the Jewish people (including those of neocon persuasion behind the cifwatch.com) should be proud of. Soros grew up as a Jewish teenager in Nazi-occupied Hungary, and in 1979 began sponsoring black students in apartheid South Africa. He founded one of the first hedge funds, but since the 1990s has given away $7bn “to support human rights, freedom of expression, and access to public health and education”. His Open Society foundations have helped build democratic cultures in many eastern European states. There would be a few of us here who would have served in the IDF,Would you consider that to be a good cause. A lot of the money that Soros donates,goes to undermine the state of Israel.He gave money to sponsor black students in SA,how many dimes did he donate to sponsor Jewish or Israeli students.He’s no benefactor just a cheap and sleazy manipulator. I suppose Compay that you are proposing that the damage he attempts to cause to Israel by funding such NGOs as Adalah which seeks the destruction of the state, should be forgiven because he does good elsewhere. Perhaps Israel is less worthy of consideration because it’s a Jewish state or because it’s out of fashion at the moment. I will try to understand that when the rockets fall on Israeli children, but it won’t be easy. >There would be a few of us here who would have served in the IDF, Would you consider that to be a good cause. Yes, IDF can be “a good cause” but only as long it acts on self-defence. >Perhaps Israel is less worthy of consideration because it’s a Jewish state or because it’s out of fashion at the moment. Soros is a bit like Daniel Baremboim: a cosmopolitan philanthropist, an international figure, an unselfish humanist. Also, according to wiki he’s an atheist. This does not make himself less Jewish yet his links to the Judaism proper are perhaps superficial to say the least. 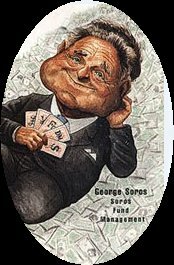 Soros emigrated to England in 1947 and, as an impoverished student, lived with his uncle, an Orthodox Jew. His uncle paid his living expenses while he attended the London School of Economics, where he received a Bachelor of Science in Philosophy in 1952. While a student of the philosopher Karl Popper, Soros worked as a railway porter and as a waiter. A University tutor requested aid for Soros, and he received £40 from a Religious Society of Friends (Quaker) charity. He eventually secured an entry-level position with London merchant bank Singer & Friedlander. He has a cousin from that family era, Caron Enlander (née Weiss) in New York. Indeed. Both are self-absorbed, autocratic (even dictatorial), selfish jerks whose inexcusable behaviour is contemptuous of the humanity of their fellow Jews. May their boils have boils. And has been accused of collaboration. Perhaps like Kastner and other collaborators it is time for the charges to be aired in a court of law. “Yes, IDF can be “a good cause” but only as long it acts on self-defence.” Compay apply your principles more evenly. Soros is acting belligerently towards Israel by contributing towards those who wish to delegitimise her. This is not self-defense. He is scum. That’s news to me! Does the accusation have any ground? Or it is simply a rumour? Now Compay, read Ruth Wisse, The Anti-Semites Pointed Finger…. a direct response to the blog you have just posted. If only half of what is said about George Soros and his murky past is true then this guy should be hauled before the International Criminal Court. >This guy should be hauled before the International Criminal Court. And for what specific reason, exactly? Can you elaborate please? I did a bit of research and it was confirmed that no serious publication/newspaper/author did endorse the (frankly silly) theory according to which Soros was a Kapo. In fact, the 13 year old Soros saved (albeit indirectly) the lives of many his Jewish brethren in war torn Budapest. It is beyond my comprehension why many Israeli and neocon US Jewish individuals indulge these days in the systematic besmirching of their kin. I guess many a Gentile anti-Semite are enjoying this sad, fratricide-like, Jewish against Jewish! Sadly, you all seem to playing to their tune! Being a liberal is not a crime but a valid ideological/cultural option/choice. Afaik, up to 85% of the Jewish Americans voted for Obama hence showed liberal inclinations. Why demonize these? Perhaps you make a little effort and try to understand that being Jewish and liberal is rather the rule than the exception. It is regrettable that some of the commentators here at Cifwatch throw with mud at their fellow Jewish kin just in order to please their fundamentalist Christian/Gentile neocon Tea Partiers!